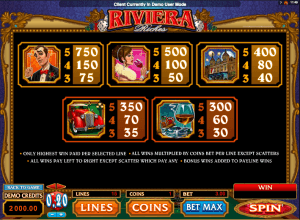 Riviera Riches (Slot Game) was released on 25th June 2011 by Microgaming. The game has a set of 5 reels and 15 paylines. The graphics of the game are bright, colorful and are inspired by the glitz and glamour of the European World. The symbols on the reels include Riviera Rices Logo, Bonus Roulette, Scatter money, Man, Woman, Casino, Car, Cigar and Brandy ad some high value playing card symbols. In the background the game has its own composed soft music along with some authentic gameplay sound effects that loops. The highlight of the game is the Roulette Bonus Feature. This glamour and glitz themed slot game has 5 reels and 15 paylines. The coin size varies in the denominations of 0.01 up to 0.50 per pay line, and wager 1 up to 20 coins per payline bet. The minimum bet amount is 0.01 and the maximum bet amount is 150.00 per spin. The maximum payout of the game is 1,500 coins per line bet. The game features Scatter symbols, Wild Multiplier symbols, Roulette Bonus Feature, and a Free Spin Bonus Round game with 3x time's multiplier values for all winning combinations. The Riviera Riches Logo symbol in the game is the wild symbol. It acts as a substitute for other symbols tp complete the winning combinations and “doubles” the payout. The wild symbol does not substitute for Scatter Money symbol. The Bonus Roulette and the Scatter Money symbol in the game are scatter symbols. The Bonus Roulette symbol only appears on 1 and 5. If it appears simultaneously on both the reels, Roulette Bonus Feature is activated. The Scatter Money scatter symbol can be scattered anywhere on the five reels to complete winning combinations, provided two or more Scatter Money scatter symbols appear. Three or more Scatter Money scatter symbols scattered anywhere on the five reels activates the Free Spin Bonus Round game. The free spins feature triggers when three or more of the scatter Money symbols appear across the reels. During the feature players will be awarded with 12 free spins with a 3x multiplier. This feature can be re-trigger and lucky player will get the chance to win up to a huge 190,000 coins during this feature. The Roulette Bonus round triggers when the Roulette Bonus symbol appear on reels 1 and 5 at the same time. During this feature a European Roulette wheel will appear on the bonus screen and the player will need to guess one of 36 numbers on the Roulette felt to win the bonus amount. A guaranteed extra win of 4x multiplier will be awarded in this feature and up to 30,000 coins can be won at the end of the feature. Riviera Riches is based on a luxury, riches theme. It will take the player into a fancy, luxurious trip of a casino. The symbols on the reels clearly depict the life and style of the rich and famous of the European World. It showcases the comfort and extravaganza which comes with the riches.